The world is full of choices…chocolate and vanilla, long or short hair, domestic or imported beer…even houses come in a wide array of style choices. In Florida, we often see large, looming luxury condos and townhouses which are typically of two-story, rowhome design in the more urban areas. Neighborhoods and single-family waterfront homes tend to be single-level ranch style here. Our historic areas showcase beautiful houses from a bygone era, including colonials, which offer a more formal style with dormers, shutters and columns; Georgian colonials, which are typically a simple box shape; and Victorian homes, with ornate trim and multi-faceted roof lines, which emerged between 1830-1910 during the reign of Queen Victoria. From time to time, you may even see cottages – small homes made of stone or wood siding, typically with curved entryways, brick front walkways and bright exterior colors; and, in the more rural parts of Florida, log homes. In other parts of the country, like the Southwest, you may frequently find Spanish architecture. Mission Revival – with clay tile roofs, arched corridors and bell towers – is the most popular style of this type of home. Pueblo Revival offers homes made largely of adobe and rounded exteriors. There’s the Cape Cod, inspired by Britain’s thatched roof cottages; the Craftsman with its open floor plan, built-in furniture and exposed beams. Tudors have steeply-pitched, multi-gabled roofs with timber framing. There are plantation homes with tall columns and plaster exteriors. The Mid-Century Modern style homes that flourished from 1945-1980 have large windows and flat planes. There is modern contemporary architecture, as well as Art Deco with its flat roofs and rounded corners, inspired by 1930s Hollywood and Miami. The choices for home styles go on and on, and if you are building, you can certainly put whatever you want wherever you want! 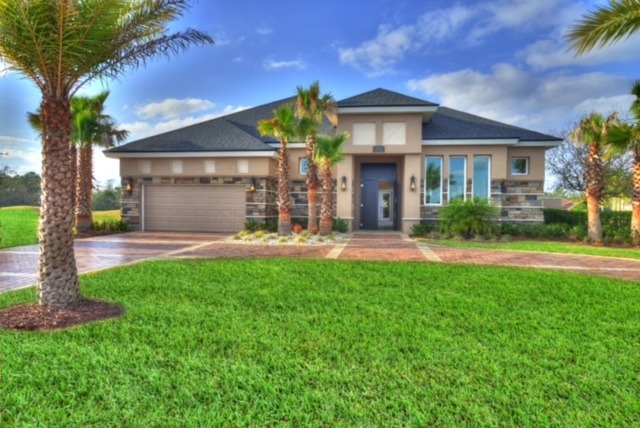 To find the perfect home or property to reflect your style, contact Arnie Traub, Greater Daytona and New Smyrna Beach’s trusted realtor of choice.